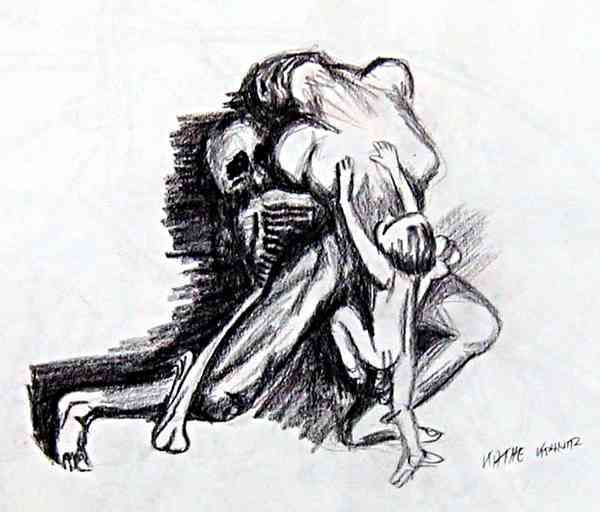 A conte crayon sketch from a drawing by Kathe Kollwitz. Kathe Kollwitz- Conte crayon sketch from one of her drawings in a book. For anyone interested in learning how to draw, a study of famous artist's work is essential. After studying a master work of art for long enough to be able to draw it, you must have a better understanding of what it is all about. It may or may not help your actual drawing skills, but it sure increases your appreciation when you see the work of a true artist. Kathe Kollwitz (1867-1945) German sculptor and printmaker was certainly that. She did many brutally honest self portraits during the course of her life. They keenly record the ravages of time on the face of a person who lived through both world wars. As a doctor's wife she saw first hand the suffering and privations of the poor during the bitter years of the first world war. In her later years she lived under the ever present threat of the death camps in Nazi Germany. I don't think that any other artist has depicted the essence of human suffering better than Kathe Kollwitz. Apart from Rembrandt, I don't think that anyone has left behind such a moving series of self portraits. If you live close to a museum that shows some of her work, GO AND SEE IT! While you are doing that spare a thought for us poor sods at the other end of the world who only have books and the net to rely on. Talking about self portraits, I did one myself in pencil a few years ago. I somehow got the eyes wider apart than they should have been, The chin was firmer and somehow I got the whole face slightly longer than it is in real life. The few people who have seen it all reckon that it looks more like Paul Newman than Bill Bradley. I never did do another, quit while I was ahead I suppose.